Tonight on The Midnight Tracker, we have a side that might best be described as part historical document, part curiosity. 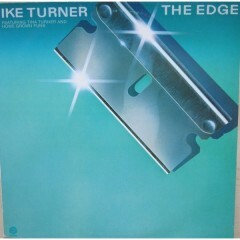 It’s from “The Edge,” a 1980 album by Ike Turner. And, yeah, that cover art is about a subtle as a sledgehammer. Ike liked cocaine, and was deep into it at the time. While Ike’s name is in the biggest type, it’s not a solo record. Side 2 is Ike playing his own songs and backed by Home Grown Funk, a popular Memphis group that had gone to Los Angeles in the mid-’70s to try to make it big. Side 1 — tonight’s side — is Ike and Tina Turner together on record for the last time (at least until the compilations and reissues started coming). It’s a bunch of covers from the mid-’70s, recorded at the end of Ike and Tina’s time together. They split personally and professionally in 1976 and divorced in 1978. When this record came out in 1980, both Ike and Tina were struggling to make it on their own. Hear, then, what the end of Ike and Tina Turner sounded like. Tina was in her mid-30s at the time and had been with Ike for 15 years. “Shame, Shame, Shame,” “Lean On Me,” “Philadelphia Freedom,” “Use Me” and “Only Women Bleed,” Ike and Tina Turner, from “The Edge,” 1980. This is Side 1. It runs 17:40. It’s out of print. Three of the cuts are available digitally on “Ike and Tina Turner Sing Great Rock & Pop Classics,” a 2011 compilation CD of covers. All but “Philadelphia Freedom” are fairly interesting interpretations. The original versions were by Shirley & Company in 1974, Bill Withers in 1972, Elton John in 1975, Withers in 1972 and Alice Cooper in 1975. No small irony that the last song is about a battered wife.